Reverse engineering firmware from the point of view of an attacker involves levering as much as possible what is accessible from the physical board. Of course the classic question this strives to answer is, if someone gets hold of my board what could go wrong? Reverse engineering some devices in the wild often exposes security keys, default passwords and other forms of security failures that can expose an unfair escalation of privilege or perhaps also allow a complete take over of the device right down to boot loader level - all of this sometimes also possibly learned by analyzing the firmware. I'm going to talk about some of the more basic skill in getting toward exposing the code and other sensitive artifacts used by the device. Before you can find remote code execs and admin auth by pass vulns you need to get to grips with firmware image formats and embedded file systems. Ubuntu LTS 18 Virtual Machine (pretty easy to set up and get hold of) https://www.ubuntu.com/download/desktop? You can then begin cd /src/[command]/ making everything but I do that during the tutorial below too. We are only going to need the uncramfs utility so you only really need to make that right now. Once we have a firmware image we would like to look at; what you need to know is how to detail what is inside it. A firmware image is just a stream of bytes like any other that has its own boundaries and segments. The firmware image is essentially what allows control to branch to the kernel or it contains the kernel itself sometimes, and sometimes its almost all of the software that will run on an embedded board. Booting can be done a number of ways, there are a couple recipes for making the process simpler like grub but for now we will make no assumptions about what is in the image and unpack it as far as we can. binwalk was pretty accurate, it said that the first couple of byte streams were from an executable script supposedly named after one of my favorite Ricky Martin songs. Just kidding not sure why its labeled that way beyond indicating that it is to be executed by a born shell variant. 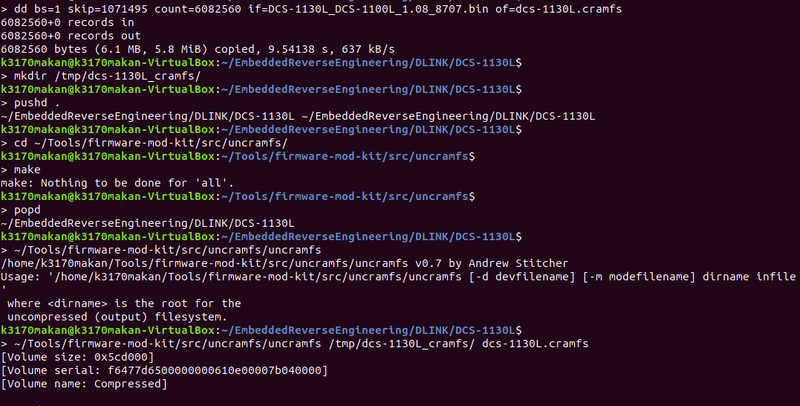 How do we actually get hold of the contents of the filesystem and firmware? Well thats why I made a massive header for the next section. So you can read it and realize stuff! skip means start copying after this many bytes or from that offset in the file. I used a block size of 16751 bytes because this is where the CRC polynomial table begins, and will definitely include all of the script contents. It strips out a little more than that though. Clearly the line extract $self is a dead give away! The ddPack program I suspect allows them to skip over script bytes until it reaches this "Firmware Boundary" string in the file.